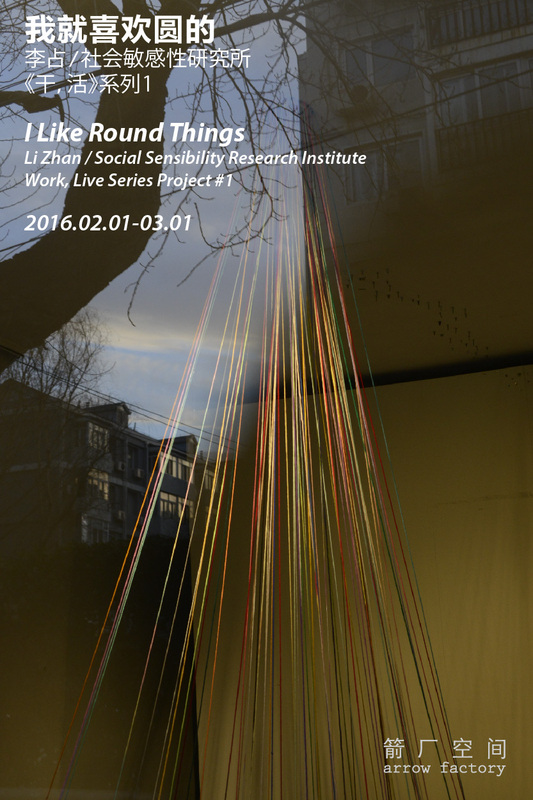 Arrow Factory is pleased to present I Like Round Things, a project by Li Zhan developed in collaboration with the Social Sensibility Research Institute. 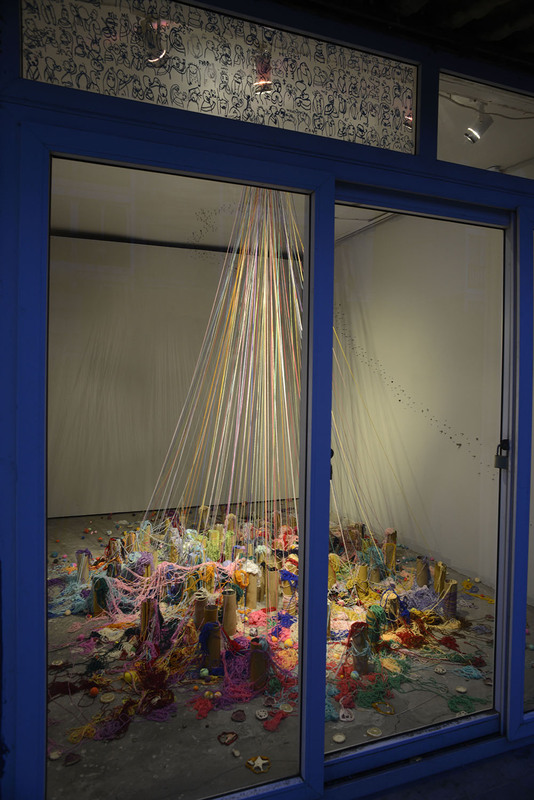 I Like Round Things is a maypole-like arrangement of materials culled from Li Zhan’s work place and private life. 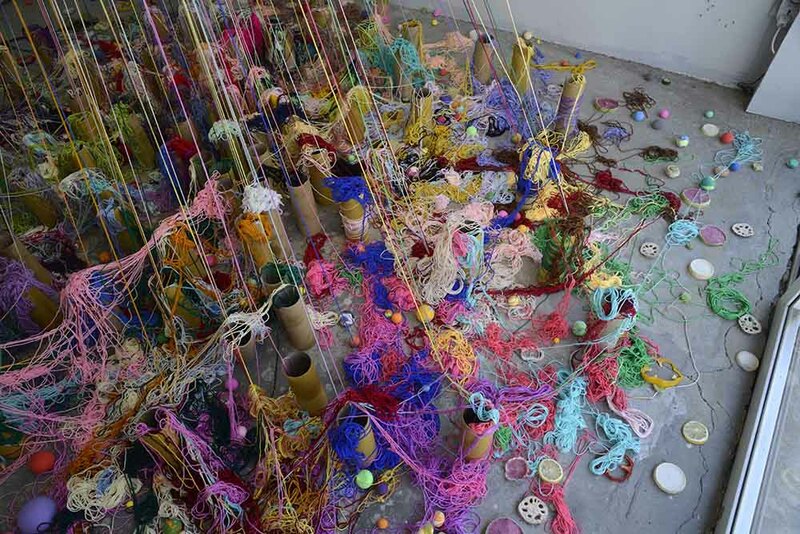 The installation sees cascading balls of multi-colored yarn unraveling into strategically arranged cardboard tubing. Two-toned balls of modeling clay are strewn amongst carefully sliced vegetables and Li’s personal assortment of “non-conforming” workplace components trace a constellation on an adjacent wall. All of the objects were either amassed piecemeal at Li’s assembly line job or trigger strong emotional associations. Working in conjunction with Alessandro Rolandi and Zhao Tianji of the Social Sensibility Institute, Li’s I Like Round Things channels personal nostalgia into an intimate compiling of elliptical objects, a quiet trickling act of compilation that unwittingly charts the passage of time. Since 2011 Alessandro Rolandi has facilitated the Social Sensibility Research and Development Department, an artist-in-residency program embedded at Bernard Controls, manufacturer of electric actuators for valve automation. 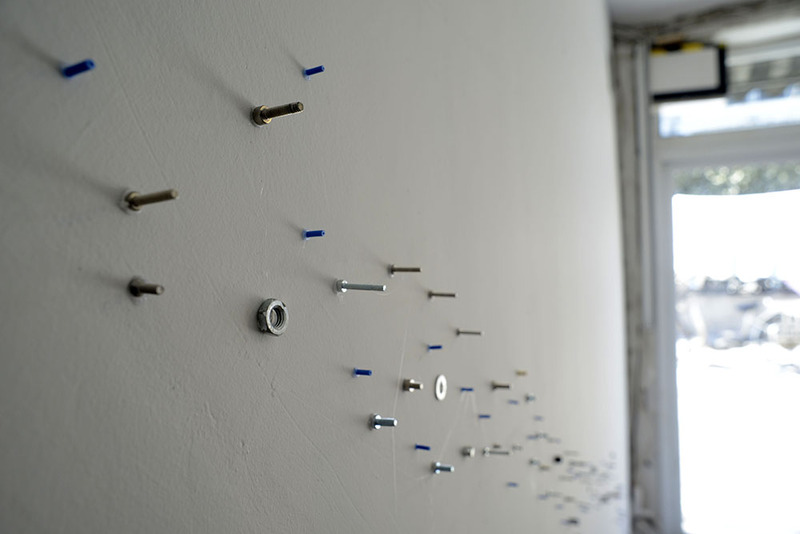 The department has realized numerous site-specific projects through interactions between artists and Bernard Control’s staff members. Now, working with Tianji Zhao, the program is evolving towards empowering the company’s employees to make original creations. 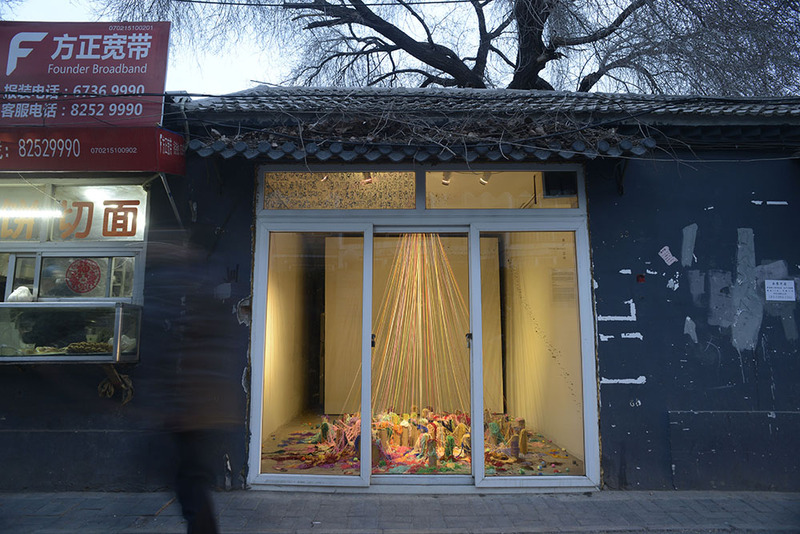 I Like Round Things is the first project in the Work, Live Series that will bring nascent ideas from the factory floor out into the hutong context, with the intent of blurring the divisions between work and private life, artist and worker, audience and creator. The Work, Live Series is an exploration into the transformative potential of creative processes and inquiry into alternative meanings of authorship. This project also marks the evolution from the Social Sensibility R&D Department at Bernard Controls, still active, to a new entity called Social Sensibility Research Institute with the aim to develop further possibilities and collaborations for this newly open path. Li Zhan (b. 1986, Beijing) is in her eighth year working on the assembly line at Bernard Controls. Her job consists of joining components into electronic circuits and training new employees to do the same. Social Sensibility Research and Development (SSR&D) is a department created for artist Alessandro Rolandi in Bernard Controls, a French company producing actuators for nuclear valves, with its Beijing branch located in a factory near the south 5th ring. What is the Social Sensibility? After five years working on it, with it and for it, I still don’t know. This term was chosen together with the CEO of Bernard Controls Guillaume Bernard in 2011. We continue to resist specific models and definitions, hoping it will exist as a form of its own in order to stay active and alive. Art is not the purpose, but a side effect that can influence the sensibility of those who are exposed to it. Social Sensibility attempts to extend this side effect to a broader audience, and to transform the relationship between art and people in creating an active and shared space. This is done by inviting artists to interact with people in working environments on a long-term base and in an informal way. By bringing art practice in direct contact with daily and working life, the aim is to inspire an audience of art users, instead of art viewers, whereas artists are challenged through this firsthand participatory experience. Economically speaking, Social Sensibility proposes the emergence of a parallel model to the existing one, in which artists would be supported financially not for the production of objects, but for their involvement with experimental and daring ideas, in the reality of society and working environments. Social Sensibility engages with two socially driven forces: a transformative one and one that belongs to the realm of vigilance. The first one employs creativity, communication, critical thinking and art as a vehicle to give birth to a new organic social dynamic. The second one resists alienation, short-circuits hardwired behavior, and supports diversity, mutual respect and collective interaction as premises to awaken the social imagination for a foreseeable change. The key moment is this physical encounter between artists and people, in which the rules of engagement are invented and negotiated all the time. In a tangible and relational space, this small and humble moment is very fragile but extremely precious, and it possesses unlimited potentialities. From this undisclosed territory of becoming, an intuition emerges and gradually takes the form of a quest into the nature of free will.